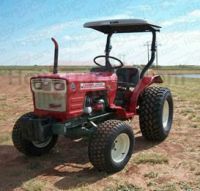 The Yanmar 1500 (D) is a 18 horsepower tractor that was sold new in 1975 to 1979. The Yanmar YM1500 has no water pump. It relies on hot water rising to circulate coolant. A max of 15% to 30% coolant mix is required. The Yanmar YM1500 was built between 1975 and 1979. It was redesigned midway through production and divided into what is commonly called the "red" and "green" model based on the original hood color. 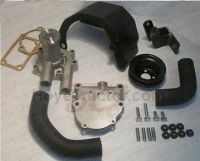 The Yanmar 1500 does not have a water pump (though we offer a kit to add one) and does not have a thermostat. it is important to keep the coolant mixture to about 25% antifreeze during the summer to prevent overheating. The small 2 cylinder diesel engine is amazingly reliable. 2)- Adding a loader and treating it like it is a bulldozer. The YM1500 front axles can not handle abuse if a loader is added. Parts availability for this tractor is VERY good. There are very few parts that are not in stock at all times.